Another gripping serial killer thriller from the Queen of Scream. Young girls are being kidnapped and so are their mothers. They are being bought and sold as slaves. Behind these kidnappings stands a ghostly person who calls himself the Boxer. He finds the girls and their mothers online, where he stalks and chats with the girls until he decides who to pick up and sell. A new reign of terror has fallen on the unsuspecting residents of Cocoa Beach. They think their worst nightmare is the environmental catastrophe causing the thousands of dead fish in the river until the first body turns up among the dead fish. Mary Mills' personal life is in chaos. She is trying to balance being a divorced mother and dealing with the presence of her ex-husband's new girlfriend in her, and especially her son's, life. Mary gets on the trail of the disappearing mothers and daughters, and when she finally thinks she has it all figured out, it becomes clear that nothing is what it seems. Meanwhile, Mary's brother Blake is preparing an attack on her, and before she knows it, she is the one who desperately needs the help from her friends in the 7th Street Crew. 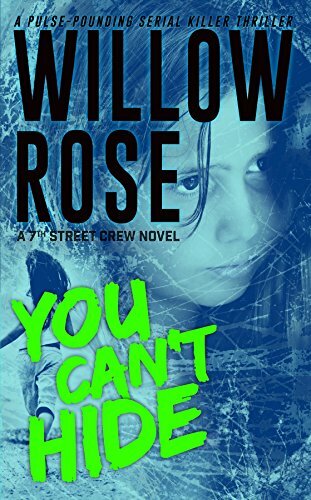 Every bit as pulse-pounding as her other books You Can't Hide, delivers further proof that Willow Rose is the most addictive thriller writer around. The fourth book Careful Little Eyes will be released in the fall of 2016.